A "serious" blaze at a West Midlands secondary school which caused a building to collapse is being treated as suspected arson. The two-storey Sidney Stringer School in Cox Street, Coventry, was evacuated when a gym fell down in the blaze which severely damaged the school. 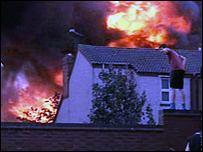 At its height, more than 100 firefighters tackled the fire which started at 1530 BST. A spokesman said police and fire officers were looking into the matter. The initial findings at the scene had caused the blaze to be treated as suspicious, the fire spokesman added. Pupils were being led out of the affected building when crews arrived. There have been no reported injuries and there were no reports of anyone being trapped inside the building. The school is located in the Hillfields area of the city, quite close to the city centre. BBC Coventry and Warwickshire reporter Tom Cooke said: "You could see the flames shooting up into the sky. "The entire area of Hillfields and this end of town is virtually shrouded in thick, grey smoke. "The affected building is the sports hall area towards the rear, next to the big astro-turf pitch which is used by the school children and by football clubs during the week." Head teacher Brian Worrall said the school, which did not have a sprinkler system, would definitely not be open to staff and pupils on Wednesday. Phil Loach, of West Midlands Fire and Rescue, said crews had managed to contain the fire to 40% of the building. Asbestos has also been found and nearby residents are advised to stay indoors and keep doors and windows closed. The blaze took three and a half hours to be brought under control and crews are expected to remain at the site throughout the night. The school, which specialises in maths and computing, takes pupils from 11 to 18 and has 1,150 on its books.